A set of bathroom drawers will provide you with heaps of space to store away your daily bathroom essentials. Drawer units help reduce clutter from the room whilst providing a stylish piece of bathroom furniture to the room. As well as keeping clutter under control they're also flexible with where you can position them; great for those who frequently reorder their bathroom. Bathroom drawers come in a wide variety of stylish designs including gloss and wood finishes. 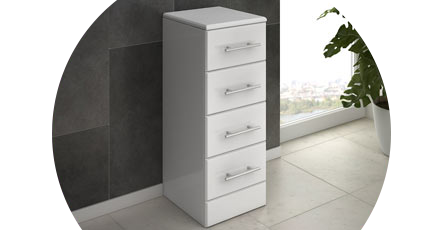 Choose from 2 drawer units, 3 drawers and 4 drawer bathroom storage units in a range of colours and sizes. Whether you're looking for traditional or modern drawers for your bathroom, we have everything you need right here. It's important to choose top quality bathroom drawers which will be durable and last. We use our bathrooms daily which means the furniture, especially bathroom storage drawers, gets used many times over. You can be assured of the highest manufacturing standards and quality materials with our bathroom drawers which come with long guarantees. Just what we wanted fits in our bathroom good.